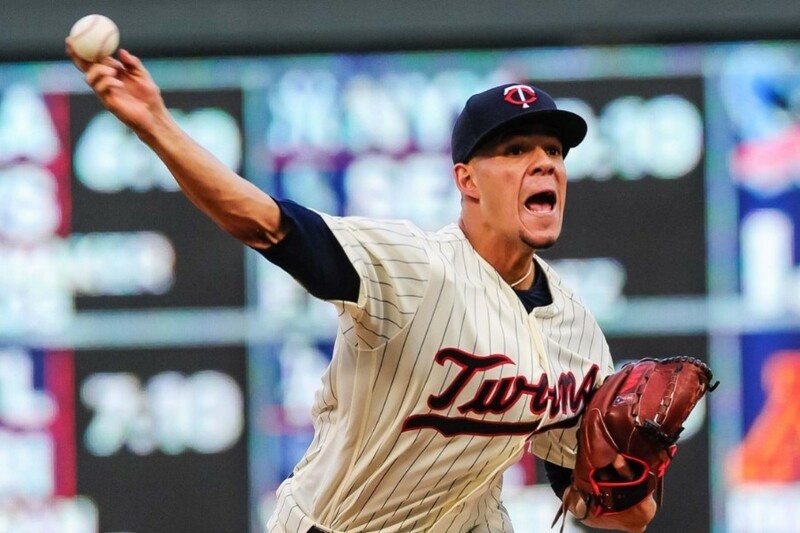 Jose Berrios had an outstanding finish to his 2018 season, becoming the eighth pitcher in Twins history to reach 200 strikeouts in a season Friday afternoon at Target Field. He's the first Twins pitcher to accomplish that feat since Francisco Liriano did it in 2010. With nine strikeouts, Berrios ends his season with a grand total of 202. The last time a Twins pitcher struck out more batters in a single season was back in 2007 when Johan Santana racked up 235 Ks. Along with the strikeout milestone, Berrios also managed to lower his ERA to 3.84, topping his 2017 mark of 3.89. "Nice finish," Twins manager Paul Molitor said. "We talked about it pregame. He’s had an overall good year. There’s been some times where I think he’s been frustrated. We saw a little bit of that — more so in the second half than the first — but he kept grinding, and I think he was motivated today. I know he wanted to win. But I know he had those 200 strikeouts in mind. Striking out the side in the first was a good way to put a dent in getting to that milestone. 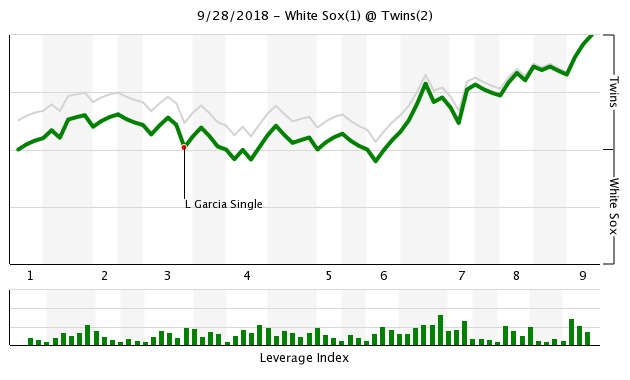 I even think he had another inning left in him, but I didn’t see any real reason to push that. So we turned it over." Robbie Grossman had another great day at the plate, going 2-for-2 with a pair of walks. Jake Cave had the only extra-base hit of the entire game, a double, and also drew a walk. Taylor Rogers pitched a scoreless eighth inning and recorded the first out in the ninth before giving way to Trevor May, who earned his second save of the season. And we will now transition to the Willians Astudillo section of the recap. Astudillo opened up the second inning with a first-pitch fly out. It’s not too often he doesn’t put a ball in play, but in the fourth inning Willians drew his second career walk. That sent his career walk rate skyrocketing up to 2.3 percent. Astudillo came up in the sixth with the game tied and the bases loaded. Instead of showing off his new-found patience, Astudillo swung at the first pitch and delivered a go-ahead sacrifice fly. Astudillo-mania has swept up Twins Territory, but the phenomenon also seems to have had an impact on his manager. "We’ve all enjoyed the story. It’s just kinda fun to watch that kid play baseball," Molitor said. With it being the final weekend, the focus is begining to shift to offseason plans. As for Astudillo? "He tells me that he’s in the best shape of his life," Molitor said. "Not sure that I shouldn’t bring out some diagram of some geometric shapes to see where he fits in there. I think he knows that he probably could do a little more in that regard, but it’s not like he’s going to turn into a base stealer anytime soon." This maybe my favorite September post.I love Berrios ending on a high note, Cave has looked great and may be a number 3 not #4 OF, Grossman has done amazing with the bat and patience - if we had a reasonable number on the bench there would be plenty of room for him.And Astudillo just astounds.If the FO does not plan to give him a chance next year they will have completely lost me. I have not been a big Trevor May fan, but I think Rogers and May look like the best we have for 8/9.Reed and Hildy in 6/7 and forget the opener. Grossman with his third straight year of being almost exactly replacement level.... I hope he's not back. Berrios, OTOH, nice. And Cave too, very nice. Awesome season for Berrios. Hope he continues to get better. Looking more and more like Cave could and should be the #3 outfielder with Kepler being the odd man out if Buxton can make a comeback and perform close to expectations. I think May is closer material more so than Hildenberger. There's plenty of room for 4 of them and injuries happen all the time, so there doesn't have to be a huge difference between the 3rd and 4th OF. Wanted to like and copy a couple posts here but phone is not letting me. Grrr! Great to see Berrios end on such a high note, especially after he struggled some in the second half. I absolutely believe we have yet to see the best of him. Really have enjoyed watching Cave this season and agree there may be potential as more than a 4th OF. Despite known struggles/issues, Buxton and Kepler will have a lot to say about that. Plenty of room for all 4. And what a great "problem" that would be to have! Astudillo should absolutely be on the 40 man! Period! I can see scenarios where he doesn't make the opening roster, but he needs to be kept. Really nice role player and I'm believing his bat plays at the ML level. Believer and fan of both Roger's and May. Remember, May is still on the comeback trail. He has largely impressed, but still shaking off rust. Also like Hildenberger but believe he's best from the 6th-8th. Is it my imagination, or has Molitor seemed more affable and relaxed the past couple of months? He's actually been humorous in some of his interviews. If Grossman can keep a .360 obp, I hope he is back next season. We are short in the obp area on offense and if Mauer retires then we are shorter still. A bench with Astudillo, Cave, Grossman, Garver, and Adrianza is possible I guess. Especially if Astudillo plays a passable 3B. 200 Ks is a really big and important milestone. Pretty cool for Berrios. Good to see Berrios back near top form. This bodes well for the 2019 pitching staff. Astudillo may be in the best shape of his life, but he should try, just once in his life, to train like an olympic athlete, like an America Ninja, like a rock-climbing gymnast. There is only one time in your life that you get to be in your 20's. You're at your physical peak, and you can push your physical limits to crazy heights. Who here wouldn't like to see Willans Astudillo come to spring training looking like he's ready to go ten rounds boxing? Imagine Astudillo with bigger thighs, and six pack abs like Bruce Lee. Go for it, Willans. I bet the Twins would hire you a physical trainer. Hell, Molitor might pay for it himself, just to see what happens. Treadmills, weights, and low-cal, hi-protein shakes, baby. Can La Tortuga become El Tigre? I actually like that bench with a healthy and productive Buxton and Kepler in the OF. And to be clear on the subject, Buxton only needs to hit around .250 (for now at least considering his potential) with even reasonable contact to let his defense and natural power and speed take over. Kepler just needs to even out some weird really splits. I could argue with Garver on the bench. I actually think Castro is a good catcher with a mediocre bat and decent power. I think we missed him this year mkre than some realize or want to admit. But Garver has a much, much better bat with potential. His defense has improved as the season went along. Whether it's early or eventually, I'd like to see Garver as the primary catcher who can DH/PH and even fill in at 1B. Is it just me, but with his physique and blonde highlights, I keep seeing "Sano Jr" when I look at Willans. Let's face it, his "shape" is round, and he's not exactly speedy. But he runs better than you would expect, and I agree there appears to be some quickness to him. Hey, athletes come in different shapes and sizes. I know his shape, but don't know his conditioning. I know your post was tongue-in-cheek, but considering the opportunity that may be in front of him, you do have to wonder a bit about him shedding a few pounds to get ready for 2019. I think Trevor may be an excellent traditional closer for the Twins the next few years. The clearly defined role might be good for his health, and it appears he has the temperament and swinging strike rate to succeed. Great job by Berrios, hopefully he keeps improving to at least a #2 starter. A pitcher that actually strikes out batters? Hey, let's hold on to him! And I also like the idea of May becoming the team's closer next year. All in all, a very nice game. Effective pitching and timely hits. Wish we had more like that this year. I'm not the biggest Grossman fan, but he certainly had a very good second half. He may be replacement level, but I'm not sure we have a bunch of better options waiting to be called up. And it sure is nice to have a player posting a decent OBP on a regular basis. Of course you also have to put him in the field once a while. I can sympathize with Willians. Fifty years ago, a team mate of mine in college said to me: "Terry, you were blessed with the skills of a professional athlete, but cursed with the body of a professional baker." My spare tire has never left me despite the efforts of Nutri Systems, Weight Watchers, and other outside agents. These last few games, Berrios has been reminding us what he can be.Don't know what caused the late summer bump?Maybe all the hype surrounding the all-star game.Or was it the stress from a couple complete games? I really believe he can take that last step to become a legitimate ACE, one of the best half dozen starters in the game.Now will he do it next year or will we have to wait longer? I don’t get the Grossman disdain. He is not replacement level—he has .9 WAR this year and a 109 wRC. He’s certainly not a star, but it’s not his fault the Twins try to use him for more than they should. Let him start a couple of games at DH, maybe one in the outfield every week, and bat him in the lower third, and he’s perfectly acceptable. You have to be consistently good over the course of an entire season to finish with over 200 strikeouts. If anything, this has proven the idea of him not being good this year is vastly exaggerated.